Apartment of good standing in a small quiet and charming residence located near the port of Cabopino and the classified dune of Artola. The sun terrace overlooking the pool makes it an ideal holiday spot! Beach. It is also very well located, close to shops on foot. Located between Malaga and Marbella, the apartment is ideally placed for you to discover Andalusia and its sites. You will be 2:25 from Seville, less than an hour from Ronda, 1:30 from Granada and 1h15 from Cordoba. Check in: for arrivals after 22:00, there is a supplement of 20€. Overall we had a very pleasant stay once we had a couple of issues resolved the apartment was comfortable and clean and kept that way by the competent cleaning staff during our 3 month vacation. 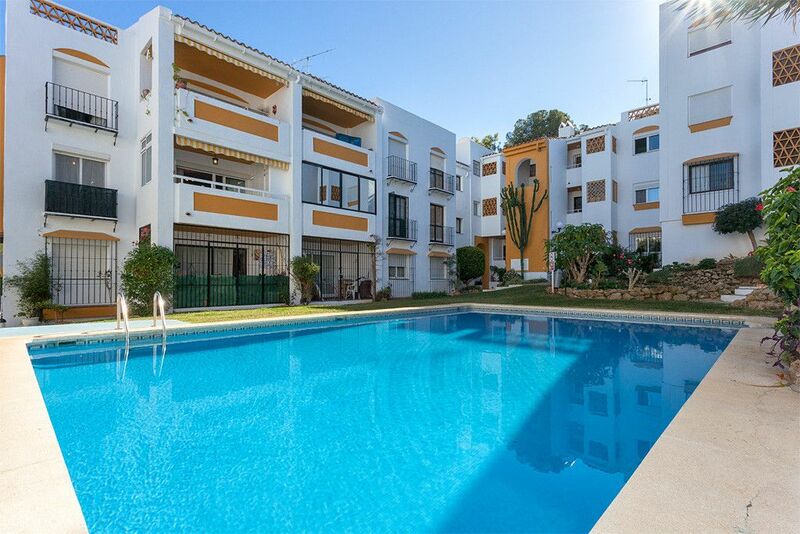 When we return to Spain we will rent this apartment again it is located in a quite complex very convenient for local shopping and traveling to the tourist areas of the Costa del Sol. We had a terrible experience with this property owner and I strongly urge you not to book with Anthony. The first issue was with directions to the unit. Instead of sending me the actual address, I was sent a link to a google map that only listed a street name and number. After driving around for two hours, talking to the maintenance guy who was assigned as our contact, we realized that Mijas has two streets with the same name. We were then given a completely different street address. That address took us to a main street near the property but it was still incorrect. (We were working with two iphones so this wasn't an issue with our ability to follow directions. The address isn't on the map.) The maintenance guy finally found us standing on the side of the road and he directed us to the complex. We were frustrated but happy to finally be in our unit. The apartment is fine and it looks like the photos. It looked clean and things seemed to be in order. However, we were then asked to provide a damage deposit equal to three times the cost of the rental in cash to the maintenance guy. We were shocked. This guy didn't even work for the property owner, and he wanted us to hand over that much cash? We said that we were happy to provide a deposit via credit card but we felt uncomfortable handing over that much money to a stranger. What if he wasn't around on Sunday when we were ready to leave? What if he decided that we broke something? Paying by credit card wasn't an option and this wasn't a risk we were willing to take so we left. Anthony is refusing to refund the two nights that we paid for (even though we booked the day before so it is highly unlikely that he would have booked with someone else). I am extremely disappointed in how we were treated. 1.Le locataire a reçu par mail et par sms le lien exact de l’appartement via google maps. 2.Les conditions financières de la location sont claires: caution dû à l'arrivée. 3.Mes collaborateurs ont attendu deux heures dans l'appartement puis ont fait 20 km pour aller les chercher. 4. Le comportement et les propos tenus à leur égard sont inadmissibles et ne justifient aucun geste commercial. Un appartement à proximité de tout ! L'appartement est superbe, exactement comme sur les photos. De plus, il est proche de toutes les destinations intéressantes du coin ! Aussi bien la plage à 5min en voiture, Mijas pueblo le village blanc à 20min, Malaga à 25min, Marbella à 15min, ou encore Gibraltar à 1h ! Il y a moyen de beaucoup s'occuper pour des vacances bien remplies et de renter des différentes activités dans un appartement très agréable avec sa piscine très peu occupée et très bien entretenue, ainsi que la propriété sécurisée. Content que vous ayez passé un bon séjour. L'appartamento è pulito e ordinato, situato al primo piano ed ha 2 camere da letto, bagno cucina, sala da pranzo con divano e balcone con tavolo per mangiare. Si trova nell'Urbanizacion Sitio de Calahonda a 5/10 minuti in macchina dalle spiagge 20 minuti da Fuengirola e 40 da Malaga. Il complesso è tranquillo e dotato di piscina riservata con posti auto interni. Il letto matrimoniale è di larghezza ridotta e la seconda stanza ha un letto a castello più uno a canguro e il divano può diventare un letto.